QE2 is set to be completed in June. Spain’s credit rating was downgraded today. Ongoing unrest in the Middle East. Surging oil prices threaten the economic recovery. Eye-popping budget and entitlement problems in the U.S. In order to better understand the possible impact of the completion of QE2, we are in the process of studying the ‘flash crash’ period and the period following Ben Bernanke’s August 2010 Jackson Hole speech. Our work to date may help us better understand the risks of a continuing correction in today’s markets. As outlined on March 3, the longer-term outlook for stocks remains favorable, but the short-term outlook is cloudy. There were very few places to hide during the flash crash correction which kicked off on April 23, 2010. The pain for investors did not end until the S&P 500 had given back 13.20% before finding some footing on August 27, 2010. The table below shows a select list of ETFs that provided defensive cover during the dark days of 2010. In the minds of market participants, the assets listed above were the safe havens of choice when the dial on the risk trade moved from “on” to “off”. 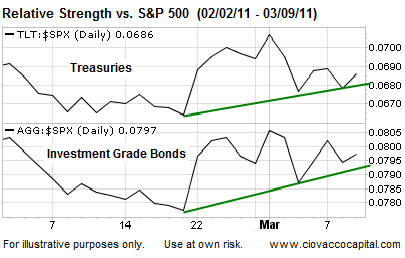 On Valentine’s Day 2011, defensive assets began to show improving relative strength vs. the S&P 500. The flash crash winners highlighted in blue above have continued to draw increasing interest from buyers over the past four weeks (see relative strength charts below). The investments listed in the table above serve as a de facto shopping list should the current pullback morph into a full blown correction. 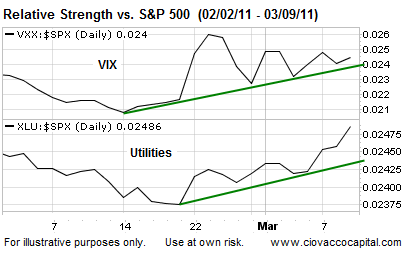 The relative strength lines of the VIX or the ‘fear index’ and utilities have moved higher in recent weeks, indicating increasing concerns about further downside in risk assets. Market participants are becoming increasingly nervous. To continue to monitor defensive assets. To be open to raising more cash, based on the incremental approach, should conditions deteriorate further. Increasing interest in bonds is not good news for stock and commodity investors. For those not familiar with technical analysis, the green lines in the relative strength charts all have positive slopes, which highlight an increasing interest in defensive assets relative to the stock market in general. Gold’s safe haven status appears to be intact. It is not time to panic relative to the possible continuation of the current correction, but we are happy we have taken some profits off the table in recent weeks. The defensive assets shown above will continue to help us monitor the risk tolerance of market participants, who ultimately determine the value of our portfolios. 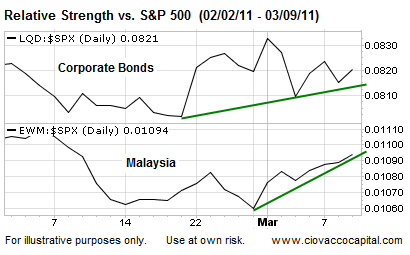 Corporate bonds and stocks in Malaysia held up well during the 2010 flash crash correction. Buyers are again showing interest over the last few weeks.